Pete and I went away last week and stopped in a new (to us) town on the drive back home. We had a nice dinner and walked around a bit before heading to the hotel to sleep. We woke up early the next day and decided to walk around the town to see it in daylight. Yelp had given me a few historical buildings to look out, but once we saw those, we were kind of stumped. "We should look for Pokémon," I suggested, half-jokingly. See, I had downloaded Pokémon Go on my mom's phone the week before and she told me to get it so we could walk around together. But, other than opening the app at home, I hadn't played. Pete and I weren't quite sure what to expect, but we decided to play. It was the best. Seriously. We had such a fun time exploring the town, letting Pokémon lead us from one landmark to another. We want to make it a thing now, going to new towns and following Pokémon to spots to see. 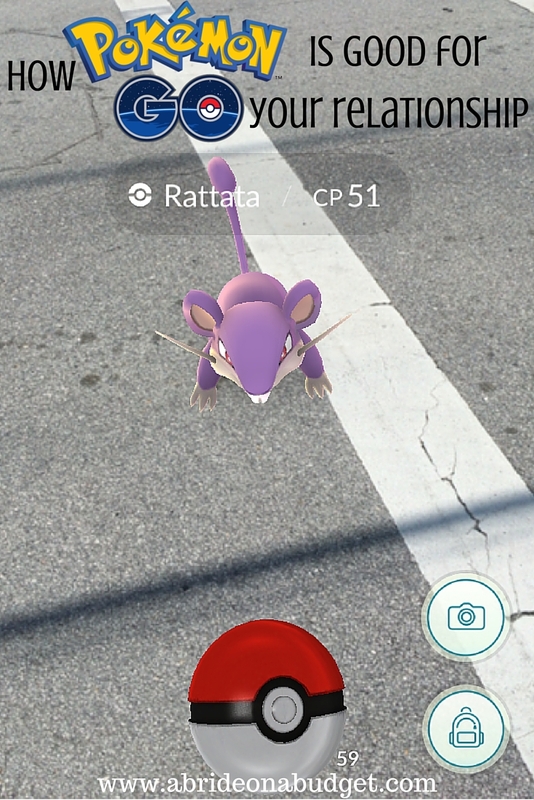 Playing made me realize how Pokémon Go is good for your relationship, so, of course, I had to write this post. So much of the fun of Pokémon Go was that we were able to explore a new city on foot. The downtown area was filled with Pokéstops, and we went from one to another -- wherever Pokémon said to go. Bell at a church? Sure. Veterans memorial? A nice way to pay our respect. Small park on the ocean? What a view! The next thing we knew, Pete's Fitbit buzzed, letting him know we had already walked 8,000 steps -- and it wasn't even noon yet. If you're already sweating for the wedding, this is a fun way to do it. More fun that what we often do at night: walk around our community, pretty much in the same loop. Each Pokéstop shows a photo of a landmark and you basically have to walk to find it. So you open the app, click on the closest Pokéstop, and figure out where it is. You talk about if one of you knows the location and, if you don't, you read the map together and figure out where it is. Even if the conversation is only about Pokémon, it still gives you an excuse to talk. Plus, you can talk about what you see on the way too. We were in a new city when we played the first time, so we were able to really learn the history behind it. Pokémon took us to different historical signs and museums. So, of course, we were there hoping to catch an Eevee, but it was cool to learn about the battles that were fought over the waterway in the town. And it's fun to learn stuff together. Maybe it's a cooking class, maybe it's painting, or maybe it's Pokémon helping you learn history. Whatever it is, learning new stuff together is a great way to evolve as a couple. You're burning calories together, which is great. But it also means you'll probably get hungry at the same time. So you can take a break from Pokémon and grab a quick snack (or meal, depending on what time you're hunting). All of a sudden, you have an impromptu date -- and who doesn't love that. Plus, it just gives you something to do together. I'll be honest. At first, I was like, "I don't get it." I would open the app when I was blogging and sometimes there would be a Pokémon on my laptop screen, and mostly there wouldn't be. So I got bored and that was that. But when Pete and I played in the real world, when we took turns catching Pokémon and got excited when the phone vibrated to let us know there was one around, we really, really liked it. So no matter what you think of it, get the app. You'll like it. And your relationship will too. BRIDAL BABBLE: What other ways is Pokémon Go good for your relationship? I love this!! My husband and I both play Pokemon Go, and we love it. We've played around our neighborhood, and were "eh" because we weren't finding much. But this week my daughter and I went to a park downtown and had a blast. There were a lot more to catch, plus plenty of Pokestops. I don't play Pokemon Go, but my husband does, and my three year old daughter loves to watch the eggs happen and him try to catch stuff. We go for a family walk every night so h can catch pokemon, so even if only one of you play it's still good! Have you linked up at #bloggerspotlight yet? It's open until Tuesday night! My boys both play and I have no real idea what it's all about. But on our holiday they had great fun going off together exploring, walking around and catching pokemon (they are both late teens) Seems like a fun thing to do to me, I was surprised how many people we could spot at main tourist attractions all standing about with their phones though. And the age of the players surprised me to , lots of people in their 20's, it's clearly not just for kids! Thanks for joining the DI & DI Link Party, we loved having you!